The summer break will be punctuated by one letter and one word per day. Today’s instalment is brought to you by… the letter D... for Diarra. Alou expressed his frustration at not playing and in so doing found himself in disgrace. Will he take a different direction during the summer? He scored 3 goals in 3 different competitions: against Nancy in the Coupe de la Ligue; in the Champions League against Steaua Bucharest; and in the league against Lens. Djila had a hell of a season… not as dominant as expected at his new club, he disappointed in the Champions League and had some problems with manager Fabio Capello. But did this fine player ever doubt that his time in Spain would be a success? The Malian even found the means to score a goal against his old club when they met in Madrid. 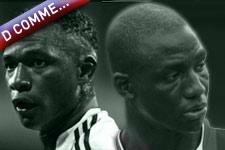 On the field of the Santiago Bernabeu stadium, the 2 Diarras crossed paths for a brief moment when the Frenchman came on in extra time (92’). He had stayed on the bench for the home leg, on September 13 2006, his first inclusion in the OL squad. While Alou just won his first French championship title, Djila has already been champion of France 5 times.